You are awarded the StoneWall Society award for "Pride & Equality" on the following criteria: the site content projects a positive model for the G.L.B.T. community; does not practise discrimination toward any group in or outside the G.L.B.T. community; contains excellent GLBT literature with a positive message; offers valuable, pertinent, and interesting information; is entertaining. That is really a great page. I can tell that a lot of love and time went into it. We have reviewed your site and are awarding you our Gold Award. Congratulations! We think your site is great and a positive spot on the web. Congratulations!!!! You have been selected to receive the "King Of The Jungle" award for outstanding excellence in your web page design. Please wear our award with pride as your page deserves it! I just wanted to let you know that yup, you won the award for February 2000, so I'm emailing you the award, and you're now listed on the BookCASE as theFebruary site. The judges decided to bestow the award mainly because your site offers something a little different from mainstream gay sites and you obviously feel very strongly about all of your subject matter. Congratulations! In recognition of creativity, integrity and excellence on the Web, your web-site has been reviewed and chosen to bear the 2000-2001 Golden Web Award. Your site is amazing! 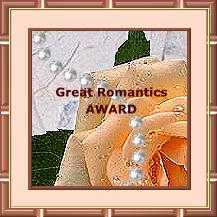 I would be so very proud to list it as a winning site in the category of "Great Romantics". You make me proud to know someone who has such a heart for others and for the world. Thank you for the opportunity to get to know you a bit better through your site. I hope many others will become acquainted with you as well. Please accept my humble award. 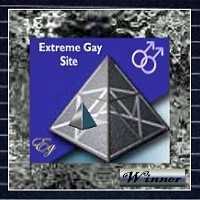 Your site has been selected to receive the WestHollywood Award for June, 2000. You have displayed excellence in creating a truly great site. After great review, it is my pleasure to welcome you as the newest recipient of the award. Thank you for your hard work and dedication to your site. It is a wonderful reflection of what a person with pride and passion in their hearts can accomplish. As a lesbian, a hate crime survivor long before the term "hate crimes" existed, as a writer, and as a woman who cares so much about the world, I can see that you are just as passionate about these things and care just as much as I do. Please accecpt them for all that you have done and continue to do, to make a difference in this world. These awards cannot be applied for. No link back is required. Just accept them and know that someone out here knows that there is someone else who cares just as much as you do. 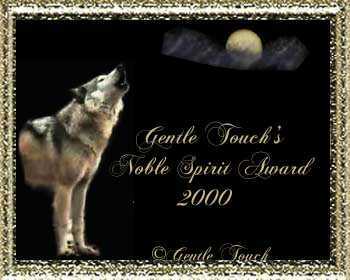 The last award that is attached is the most difficult one to receive...the Noble Spirit Award. This will be only the 8th to be given out this year since it was created at the beginning of the year. Congratulations! Your web-site has been reviewed and chosen to bear the 2001-2002 Golden Web Award in recognition of creativity, integrity and excellence on the Web. You've worked hard. Proudly display your Award. Upon reviewing your web site we wish to acknowledge it's excellence in design, and content. And dedication in making a positive difference in the quality of life of all GLBT People, GLBT Community and Society in whole. For your dedication, outstanding contribution and efforts we wish to express our deep appreciation and gratitude. Please, accept our thanks on behalf of all those who you have helped and those you will help in future. 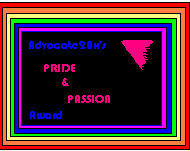 We are pleased, proud and honored to add your web site to our "Hall of GLBT Hero's" section of our web site. And send you our Award Banner to display on your web site as acknowledgement of our appreciation and gratitude for your contributions. Your site was selected one of BluWay.com's Top 10 most interesting sites today! You can see a link to your site displayed on BluWay.com. Hello, congratulations, your site has won the Power In Pride Award. The Power In Pride Award was created to inspire and recognize those websites and webmasters who honor diversity and show pride for the GLBT community on the internet. Congratulations..! On A Job Well Done. Your Site Has Been Reviewed And Has Been Chosen To Receive The 2003-2004 Gold Deco Award. You have a wonderful website, beautiful graphics, and a nice layout and design. Recently we enjoyed a very pleasant visit to your web site! It is with great pride that we announce that your web site is a WINNER of our esteemed Majon Web Select "SEAL OF EXCELLENCE AWARD"
We at GAY-DAYS Awards have reviewed your site and are pleased to offer you our GAY-DAYS award for excellence in webpage design and content! Congratulations, and we look forward to visiting your page often!